Are you participating in the Finish in ’15 Year Long WIP/UFO Challenge? All are welcomed to join at anytime! This contest is a fun event to help get your projects completed. In this post are all the photos submitted by readers so far for the second quarter of the challenge. Remember there will be a winner every 3 months and each photo you submit counts as an entry! Your photos can be any WIP (work in progress) you have on your hook at the moment, any item you just finished, any UFO (unfinished object) that’s been sitting around your house, any item that you “frogged” (ripped out to reuse the yarn for something else). 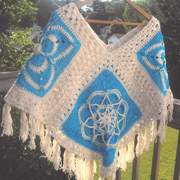 Submit as many photos are you like, each crochet item you submit counts as another entry! I love the rainbow of colors in Lynn’s work. 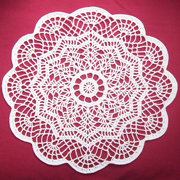 Vicki just finished crocheting this gorgeous doily. 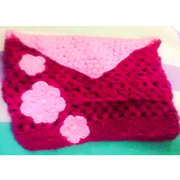 Here is Faiza’s finished crochet project in pink. 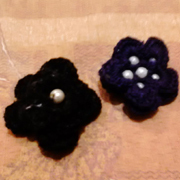 Faiza also crocheted some flowers and added beads. 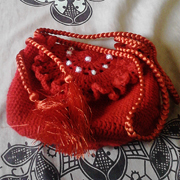 Here’s another one of Faiza’s projects. 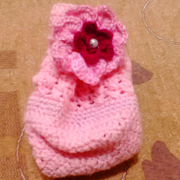 Here’s another one of Faiza’s projects with a big flower. 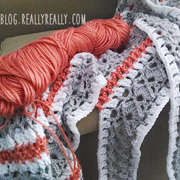 Take a look at Lynne’s spring blanket WIP. 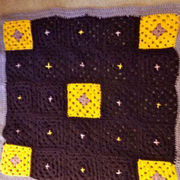 Marya’s been adding panels to her sampler afghan for 4 years. 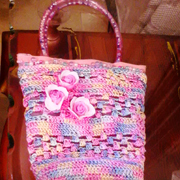 Faiza finished this lovely pink bag with handles. 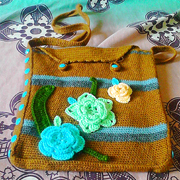 Check out another one of Faiza’s crocheted bags. 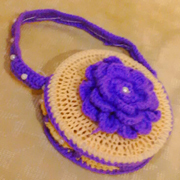 Faiza is on a roll with another crocheted purse. 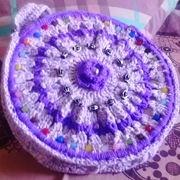 I’m loving the bead work on Faiza’s bag. Martha just finished her stash busting afghan. 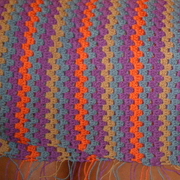 Sandy’s striped granny blanket looks great. 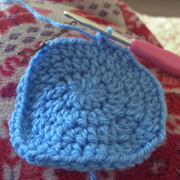 This is Emily’s very first hat in progress. 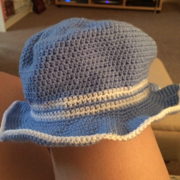 Here is Emily’s very first crocheted hat. 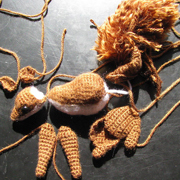 Here are pieces of Crystal’s unfinished squirrel. 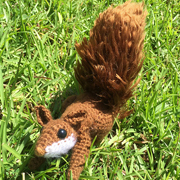 Crystal finally finished her squirrel after 4 years. Delores made her first attempt at hairpin lace. Adrienne just finished her crocheted poncho. 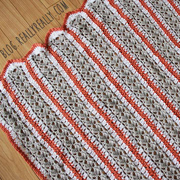 Julie is crocheting a valance for her kitchen window. 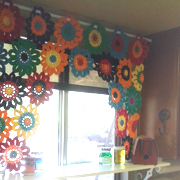 Here is Julie’s completed flower valance. 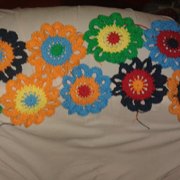 Here is Jamie’s baby blanket in progress. 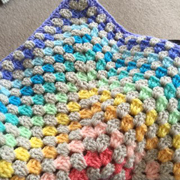 Jamie’s finished baby blanket is so pretty. 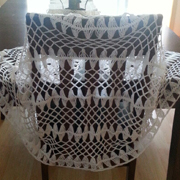 Email your crochet photos to [email protected] to enter into the contest! Or you can enter by using our online entry form. This entry was posted on Saturday, April 18th, 2015 at 12:00 AM by Rachel Choi	and is filed under Fun Ramblings. You can follow any responses to this entry through the RSS 2.0 feed. You can skip to the end and leave a response. Pinging is currently not allowed. Finish in ’15 First Quarter Contest Winner! So glad to see these beautiful entries! I like seeing what others have made. All the entries look so nice. 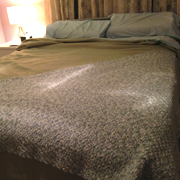 My blanket is shown! I got my blink of the eye fame I always dreamed of! 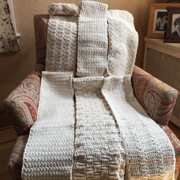 I just found a pattern for this afghan. Looks like a Fall project. OH Boy!